It’s an argument that libertarians are prone to make. As a political philosophy, libertarianism, in the broadest sense of the term, places liberty first. The role of the state is to protect the liberty of its citizens and its citizens must respect the rights of each other. One example of this philosophy is the libertarian argument that we should legalize recreational drugs in the name of freedom and personal autonomy. Drug prohibition, they argue, infringes on personal freedom by denying individuals the liberty to do what they want with their own bodies. But, society has decided that we should limit personal freedom and deny individuals the ability to harm themselves in some ways. That makes sense in many cases but now the question is should brokers limit choices? Vanguard Group, according to The Wall Street Journal, “will no longer allow individual investors to make new trades on certain investments that seek to magnify bets, pouring cold water on strategies that became popular after the last financial crisis. Starting January 22, customers won’t be able to purchase so-called leveraged or inverse products via Vanguard’s brokerage platform, the firm said in a release this past week. That cuts out roughly 400 such securities and funds currently offered on that platform. The move by the world’s second-largest money manager by assets comes as these complex products gain traction among investors and increased scrutiny from regulators because of the risks involved. Leveraged funds magnify gains–or losses–of an index while inverse products seek to produce the opposite performance of an index. Annual volumes for one popular product, ProShares Ultra VIX Short-Term Futures Exchange-Traded Fund, have soared nearly 40-fold to about two billion shares traded in 2018 from roughly 50 million in 2016, FactSet data show. The firm hasn’t offered leveraged or inverse products of its own. Brokerage customers who bought such financial instruments before the deadline can continue to own them, sell the products or transfer them to a different institution. Regulators have raised questions about these types of products. Last year Securities and Exchange Commissioner Kara Stein warned in a speech about the rise in leveraged strategies, questioning whether certain “complex and esoteric” products should target individual investors. In a 2017 agreement with the Financial Industry Regulatory Authority, Wells Fargo & Co. compensated customers after recommending exchange-traded products linked to stock-market volatility without fully understanding the risks. That followed a $2 million fine for Wells Fargo in 2012 for violations related to leveraged, inverse and inverse leveraged products. At the time of the second penalty, a Wells Fargo spokeswoman said the firm was committed to helping its clients achieve their investment goals. Leveraged and inverse funds that wager on volatility gained prominence after the last financial crisis as a way to bet on the size and severity of stock-market moves. Some, like the ProShares Short VIX Short-Term Futures ETF, were used to execute the so-called short-volatility trade that markets would stay calm. When markets turned volatile last February, some funds that bet against volatility suffered losses, prompting the closure of an inverse exchange traded note. Some investors have sought to recoup losses by suing Credit Suisse Group AG , which managed the note that closed. Credit Suisse, which declined to comment, has said in a court filing that investors were warned that holding the exchange-traded product as a long-term investment could cause losses. UVXY does show an extreme long term down trend. Other retail brokerages like Charles Schwab Corp. , TD Ameritrade Holding Corp. and Fidelity Investments still offer the products, though investors opting to buy them receive additional prompts to make them aware of risks. A Vanguard spokeswoman, Emily Farrell, said the decision to ban the products from the company’s brokerage platform wasn’t connected to any recent market volatility. 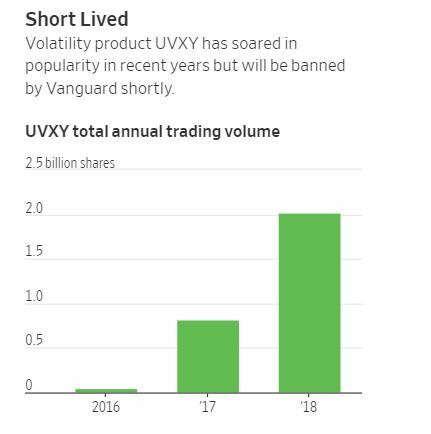 Last summer Vanguard decided to make online trading of all exchange-traded funds available on its brokerage platform commission free – with the exception of leveraged and inverse products. Ms. Farrell added that these products represent a small segment of hundreds of thousands of securities that Vanguard’s customers can buy and sell. “A very small proportion of our client base utilizes these types of investments,” she said. Should individual investors have access to these funds? Vanguard is correct that the inverse and leveraged ETFs are generally not appropriate for long term positions. They are, of course, not designed to be. The prospectus of these products clearly explain that they are rebalanced on a daily basis. This means they track the trend for one day at a time. They usually do exactly what they intended to do and follow the trend for just one day, resetting to ensure they meet that objective the next day. This means they can be a valuable tool for short term traders and the 2008 bear market demonstrates the potential appeal of these positions. Shown below is a chart of the ProShares Ultra Short Small Cap ETF (NYSE: SDD). This ETF delivered a gain of more than 220% as the stock market plunged. The gains were not delivered in a straight line and there was significant day to day volatility. While the funds have value, they are short term and high risk. Options could also be appealing to short term traders and it could be best for traders to consider buying put options when they believe that the stock market is vulnerable to a sell off. With options, traders can control their exposure. They should also understand the risks of any investment and brokers are likely to limit access to risky investments as they always have. This is part of their role in the financial system.